It may come as a surprise to many of you to learn that my life in Thailand isn’t all sunshine and smiles despite the impression I may give. Like most of you, I have my bad days mixed in with the good days. Admittedly, the bad days are few and far between and every now and then I’m privileged to enjoy a day that is beyond good. A day that is perfect. A day that reminds me why I like to travel and why I love Thailand so much. A day that reminds me how fortunate I am. Those treasured times enjoying unique experiences, creating everlasting memories and making new friends. And I’d like to thank the big fella I met in the jungle in Khao Sok recently who helped make one of those perfect days that I’ll never forget. Take a bow, Somboon. As males in our fifties, not much hair, both partial to sticky rice and carrying a bit of extra weight around the midriff, me and Somboon have a lot in common. But my life has been easy. I’ve had the benefit of a loving family to take care of me and help me when I’ve needed it. During the course of my life, I’ve had a choice about what work I’ve wanted to do or not do. Somboon hasn’t enjoyed the same advantages. 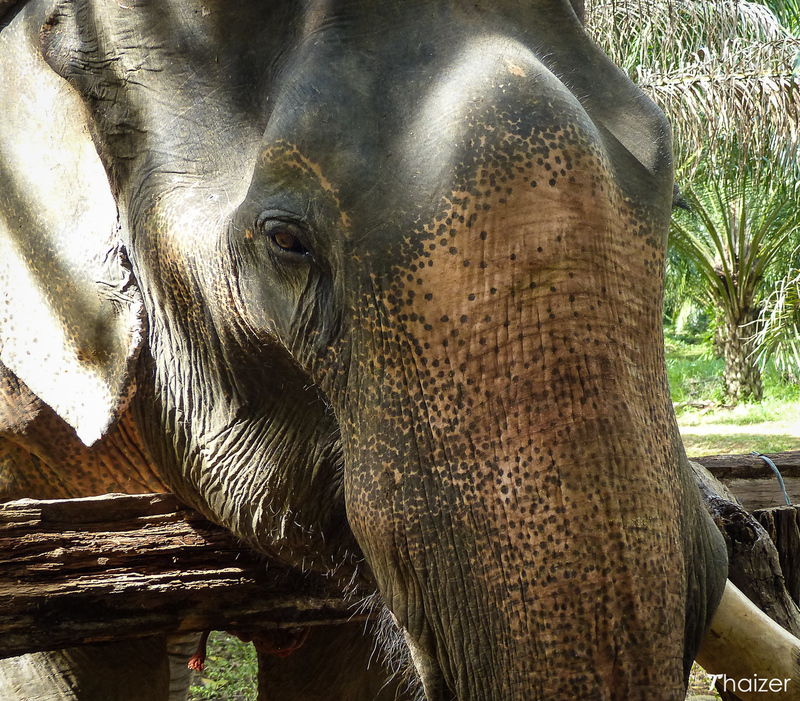 Before he arrived in Khao Sok, Somboon was forced to work in an elephant camp in nearby Phang Nga province. With a metal chair strapped to his back, his day at work involved carrying tourists on treks. An elephant’s back isn’t designed to carry metal chairs with tourists sitting on it for hours on end every day and, eventually, the time came when Somboon’s back gave in. His injuries were such that it meant the owners of the elephant camp no longer wanted him. If he couldn’t work, he couldn’t earn his keep. Prospects for Somboon were bleak, but his life changed for the better when he was rescued by a family from Khao Sok. Khun Eak and his father Khun Tee now give Somboon the respect, dignity and love that a gentleman of a certain age deserves. In the car on the way to see the middle-aged elephant, Khun Eak tells me about the gentle giant his family rescued. He tells me about the damage to Somboon’s back and the way the elephant struggles with the sight in one of his eyes. He also tells me that he is happy I’m coming to visit his family. And by that, he wasn’t just talking about his parents. ‘Somboon is my family’, the young man from Khao Sok tells me. On an expanse of land in the serene setting of Khao Sok, Somboon no longer carries the burden of a heavy metal chair strapped to his back every day. Tourists can still come to see him, but numbers are restricted to a maximum of five in a group, twice a day. And if you do go to see Somboon, be prepared to do a bit of work with the chance to prepare food for him and plant sugar cane. 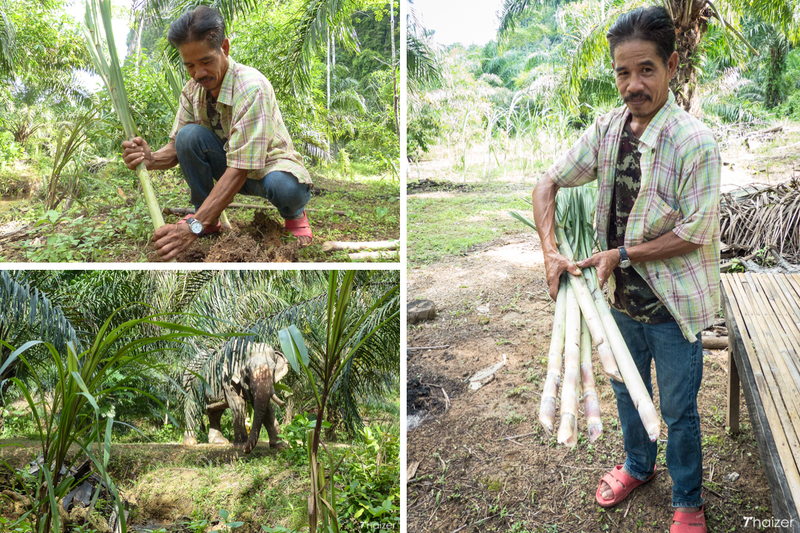 Somboon has a healthy appetite getting through vast quantities of bananas and sugar cane every day. His diet is also supplemented with protein and vitamins courtesy of Khun Eak and Khun Tee. 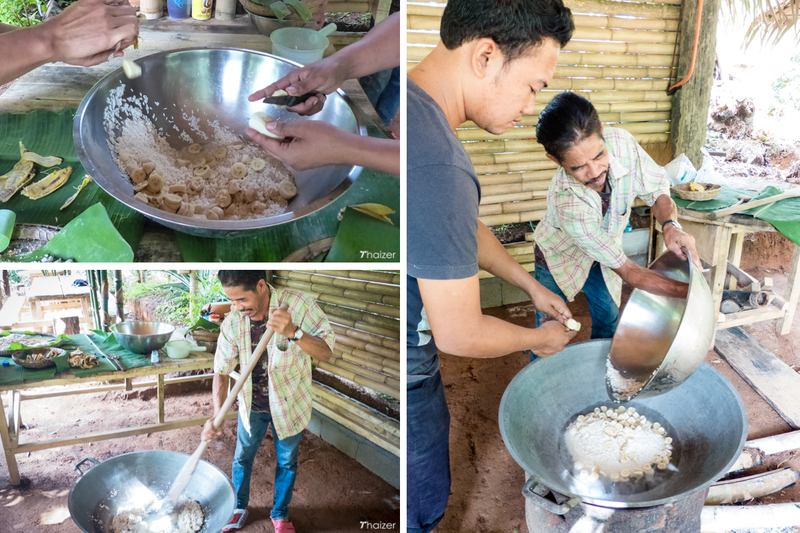 Father and son cook sticky rice mixed with grain, salt and chopped up bananas. 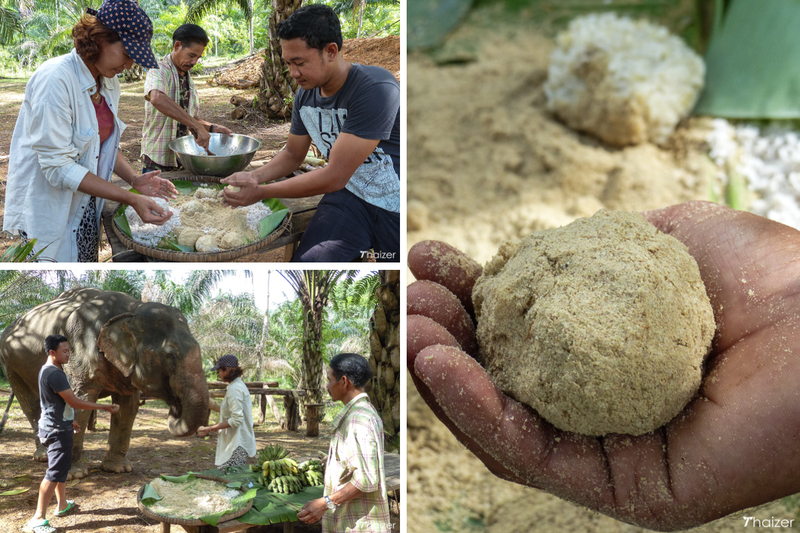 This elephant treat is rolled into balls and if Somboon needs medicine at any time it’s placed inside the sticky rice balls to disguise the taste. ‘Sometimes he is like a child,’ Khun Eak tells me with a smile. 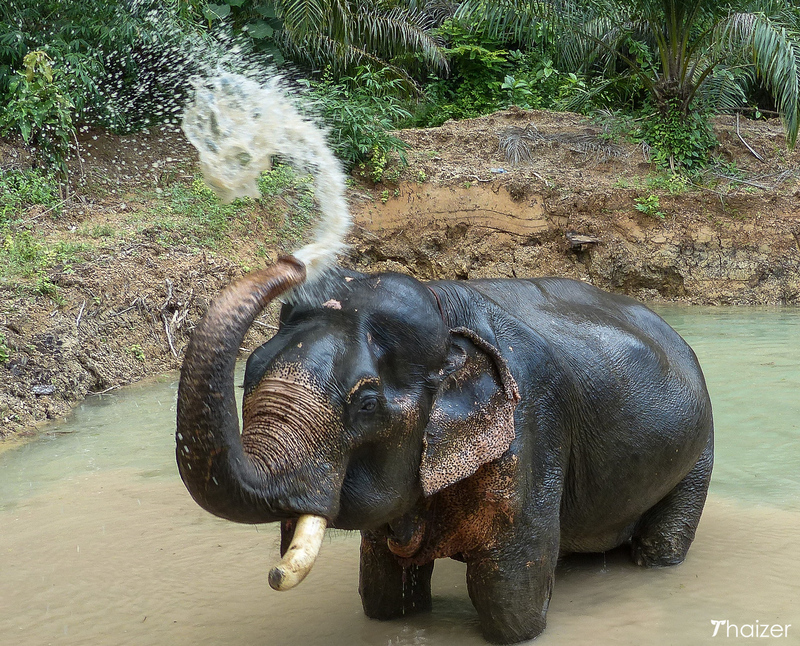 Later that afternoon helping to wash and scrub Somboon, the elephant’s playful nature is evident. You can see the twinkle in his eyes and the exuberant expression on his face as he wallows in his watering hole. 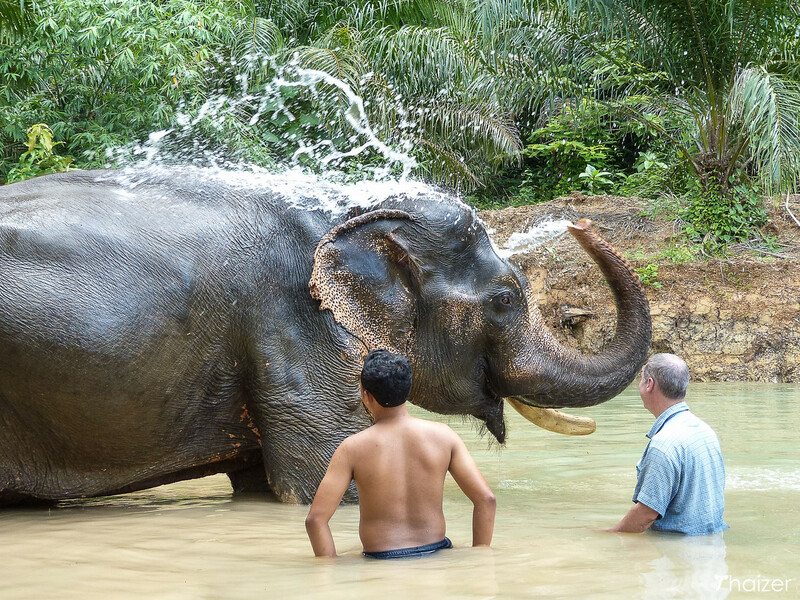 Joining Somboon in the water and helping to wash and scrub him it’s impossible not to be beguiled by his charm. Somboon is living out his retirement peacefully at his new home in Khao Sok surrounded by people who genuinely love him. With shade from the jungle that Asian elephants need and his own favourite watering holes and rivers to bathe in, life is now sabai sabai for this magnificent animal. And so it should be. Leaving Somboon behind to rest in the shade of the jungle, I take a walk up to the viewpoint at Sonchana Farm with Khun Eak and his father. As we walk and talk, their love for Somboon is obvious. 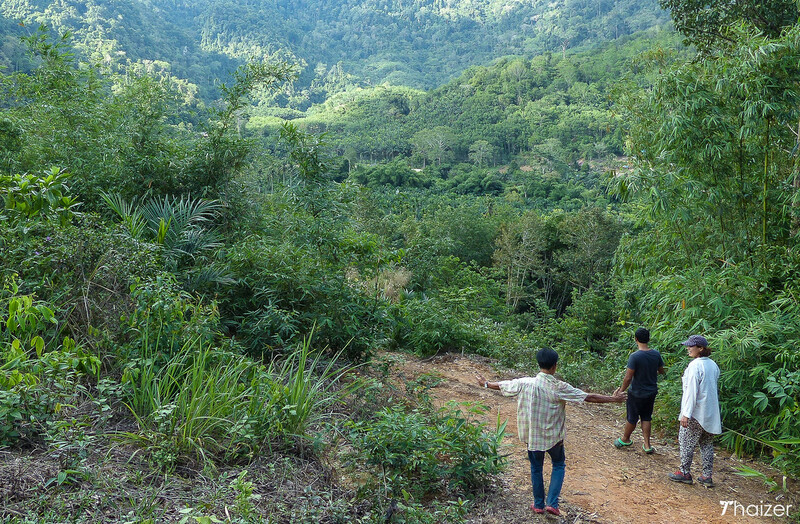 And as we reach a clearing with glorious 360 degree views of the lush green environment where Somboon and his adopted family live, it’s easy to see why they all seem so content with life in Khao Sok. 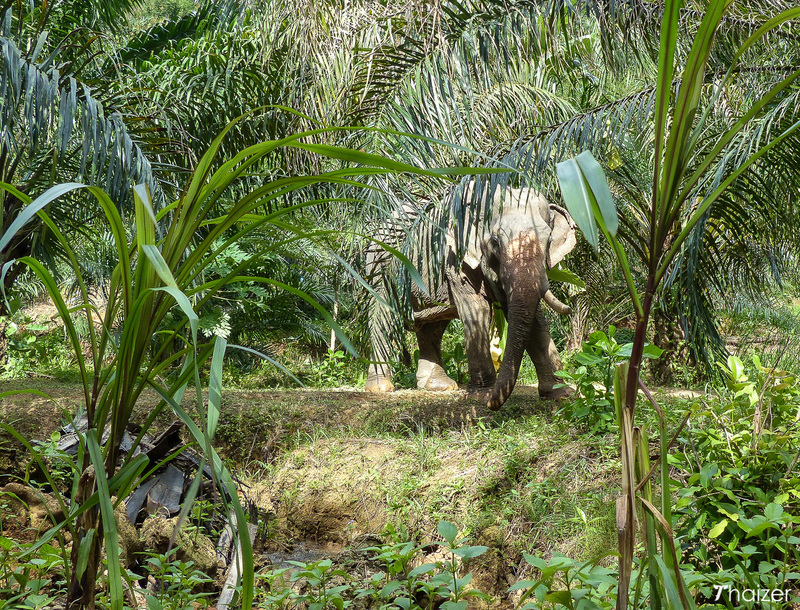 Every evening Khun Eak accompanies Somboon on long strolls through the jungle where the elephant can forage for food. When left unattended, Somboon does have one of his legs attached to a long chain to prevent him from wandering away too far or causing accidental damage. The overall quality of life Somboon now enjoys is a complete turnaround compared to his gruelling life in the elephant camp in Phang Nga. I hope I get to meet Somboon and his adopted family again in the future. Whether I do or not, I’ll treasure the few hours I spent with this beautiful creature being cared for by a family with beautiful souls. Trips to see Somboon, make food for him and bathe him last for approximately two hours with only a couple of time slots available each day; 9am and 2pm. My visit to see Somboon was kindly arranged by Anurak Community Lodge. 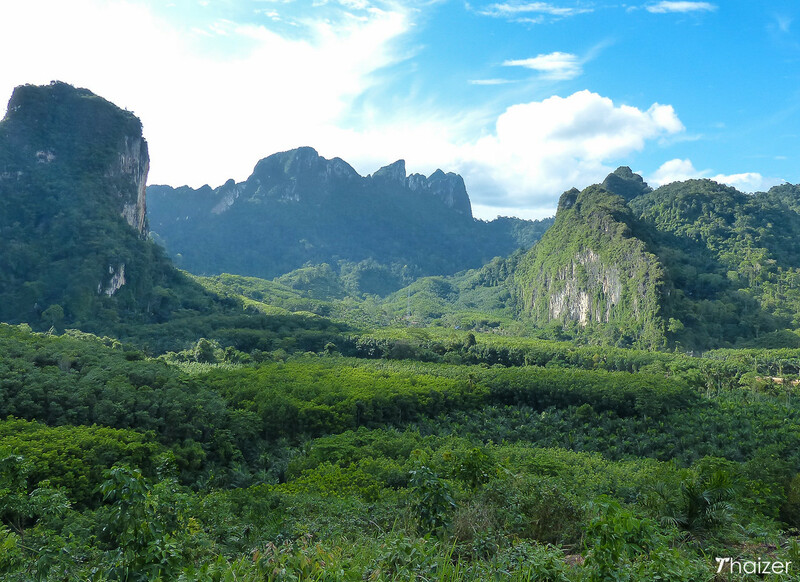 Some tour offices in Khao Sok can arrange a visit to Sonchana Farm for you, but this must be booked in advance because the number of visitors is strictly limited. Alternatively, contact Khun Eak directly via the Sonchana Farm Facebook page or call on 095 242 8600. Cost is approximately 1,300 Baht per person.